“Thanks to a guy named Buzz, the massive tree threatening our house came down gently this morning….” So began the email from my friend Nancy, one week after Hurricane Sandy slammed the eastern seaboard. Nancy and her husband live on a creek in Annapolis Maryland. Six huge trees fell on their property during the storm, five across their front yard. Driveway blocked and electricity out, but otherwise when dawn broke, they appeared unscathed. 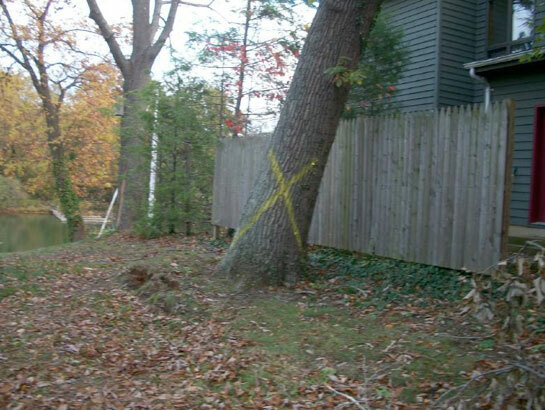 They surveyed the damage and found the root system of the enormous tree abutting their house slightly uprooted. The trunk leaned ever so slightly toward their house. About 20 feet up they saw that it lodged perfectly in the V-shaped split trunk of a medium-sized beech. Except for the beech, the huge tree was on its way right into Nancy’s house. This tree belongs to their next-door neighbor, an absentee landlord. She balked at the estimates Nancy and her husband got. Each day they waited for lower estimates, the more roots pulled out of the wet ground. Tree experts advised them not to sleep at their house but they felt too protective not to. They attempted to go about their daily routine except that both work from home. It was complicated. Seven nerve-racking days passed before the crane operator and Buzz arrived. All the while the beech held. Nancy watched from 7am-10:30 am as Buzz worked the cherry picker from side to side, back and forth, selecting and lifting one heavy branch at a time, watching how the tree’s balance shifted before he cut. She marveled how, with each cut, he factored in the branch’s recoil so it didn’t knock him from his perch. Now, Nancy’s a really self-aware person. But in tense and challenging situations, even she was unaware of how much fear she was holding. Her shaking resulted from all the cortisol and adrenaline that her limbic brain automatically and unconsciously released while the week passed. Her shaking allowed her body to slough it off – a healthy involuntary response. When your body can’t move it out, your immune system gets overwhelmed. You are more susceptible to illness, which obviously creates more stress. Stress is inherent in life. But if you think that you are overly-stressed, consider having a private session with me to reduce its impact and teach you methods to modulate it. I send heart-felt wishes to our neighbors who are suffering from the storm, job loss, illness and other tests of mettle. Thanks to Nancy for letting me share her story.